My latest Townhall column is called, “The Liberal Translation Guide: 20 Translations of Things That Liberals Say.” Here’s an excerpt from the column. If you listen to liberals, it quickly becomes apparent that what they’re saying has very little relation to reality. They’re like the “Boy who Cried Wolf” except they spend their time yelling that the sheepdog is about to kill everyone while the wolves sneak in the back gate they left open while they were too busy arguing with their friends about whether eating Chinese food is “cultural appropriation.” Ok, maybe that’s not the best analogy, but the bottom line is that it’s difficult to understand what liberals really mean. So with that in mind, here’s a liberal translation guide that will help you understand what liberals are really saying. 1) “Peaceful Protest” – No liberals were hurt while throwing bricks through windows, demanding “Death to the pigs” or getting together in large gangs to waylay small, lone counter protesters from behind. 2) “Voter Suppression” — Cutting into Democrat vote totals by taking any steps to prevent voter fraud. 3) “The Constitution” – An outdated, irrelevant document that should be ignored unless you are claiming that some liberal agenda item is guaranteed by it despite the fact that no one noticed it for 200 years. 4) “Fascist” — People who want to cut spending, abide by the Constitution and get the government off your back. 6) “Greedy” — People who want to keep money they’ve earned instead of giving it to people who don’t work as hard, but do vote for Democrats. 7) “Sexism” – Disagreeing with Hillary Clinton, opposing the abortion of female babies or being against mentally ill men being allowed to use the bathroom with women. 8) “Radical position” – Relatively popular non-liberal positions that have been around as long as anyone can remember — that liberals have recently decided to oppose almost entirely to make themselves appear more sensitive. Example: Refusing to change the name of the Redskins or believing you can’t change genders via surgery is a radical position. 9) “Angry, white male” – A white guy who votes Republican. 10) “Anti-intellectual” – Those who refuse to acknowledge that liberal college professors who couldn’t cut it outside of a university or MSNBC are right about everything. 11) “Racist” — Those who believe that people should be judged by the content of their character, not the color of their skin and those who believe in enforcing the immigration laws that are already on the books. 12) “Climate change denier” — Someone who actually judges global warming based on the available scientific evidence instead of coming up with a socialistic agenda first and then passing out grant money to any scientists who are willing to attempt to justify it. 13) “Bipartisanship” – When Republicans cooperate with Democrats to push the liberal agenda. Not to be confused with “selling out” which happens when liberals cooperate with Republicans to push their agenda. 14) “Heartless” – Supporting programs based on whether they work and are good for the country instead of selecting programs to back based on how good they make you feel about yourself. 15) “Open Minded” – Mindlessly agreeing with Nancy Pelosi and Michael Moore 100% on every issue. 16) “A Courageous Speech” — When one liberal gives a self-congratulatory speech to another group of liberals that restates things they all believe. 17) “The American Flag” — A symbol of oppression waved by ignorant, bucktoothed hillbillies dumb enough to think that this is a great place to live. 18) “Guns” — The cause of all crime. 19) “Jesus” — Someone who is completely irrelevant to any and all political matters unless you’re claiming He would definitely support gay marriage or abortion. 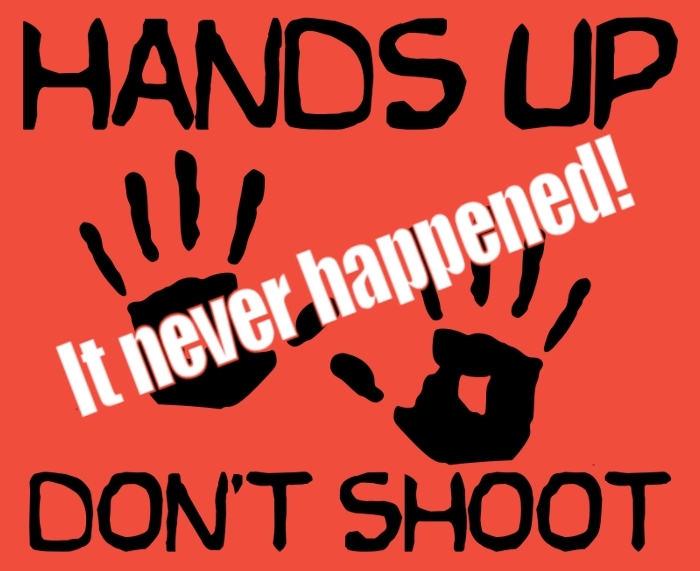 20) “Hands up, don’t shoot” —The police shouldn’t be allowed to shoot people with their hands up or people pointing toy guns at them or people trying to kill them or pretty much anybody, for any reason.